Thank you to everyone who took the time to vote in our first design survey earlier this week. Your answers are already helping to shape Dizzy Returns! There was a good spread of votes across all the choices, and it's great to see that you're looking forward to exploring new and interesting places with Dizzy. The least popular choice, though only by a small amount, was the Lava Caves - was this because of its focus on the trolls or the mention of being stealthy? If this location didn't appeal to you then please let us know why via the comments below, we'd love to hear your views. 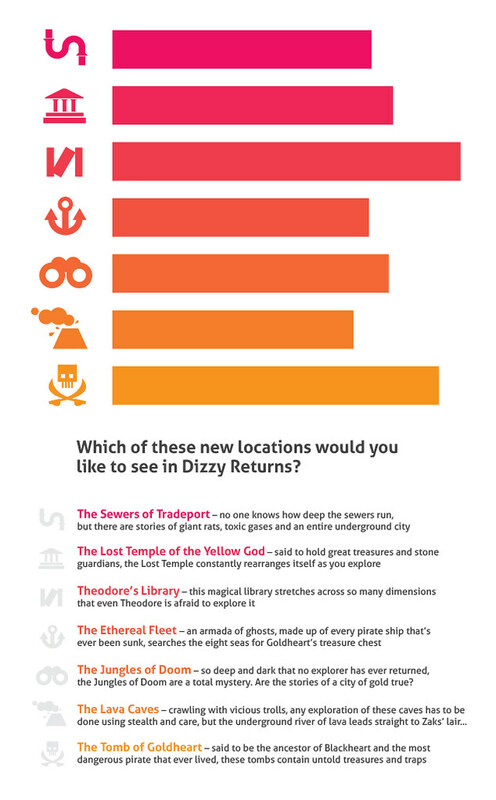 As a direct result of your votes the most popular locations, Theodore’s Library and the Tomb of Goldheart, will be included as playable areas in Dizzy Returns. Many of you have commented that from the location choices it seems that we were taking the new game in a darker and more intense direction. Have no fear, all of the locations in the game will have the light-hearted touch that defines the Dizzy world! 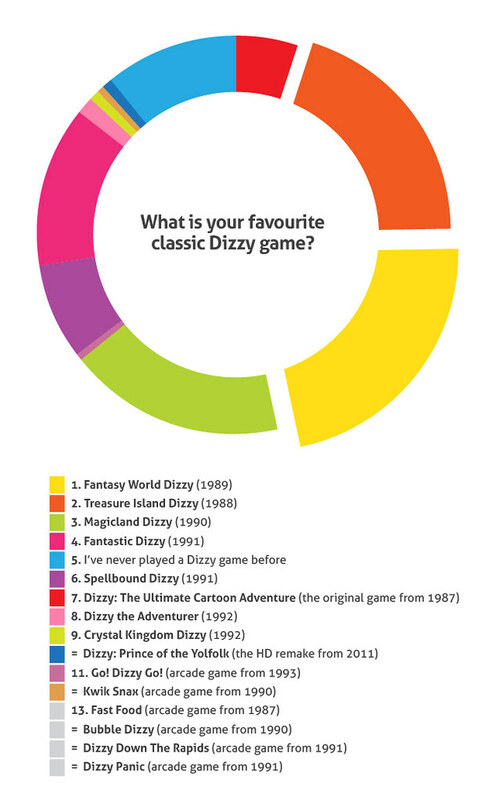 It's no surprise that Fantasy World Dizzy came out on top (it's actually one of our favourites too! ), especially as it introduced the rest of the Yolkfolk characters, making Dizzy part of a family whilst giving the game a strong goal to work towards. It's also the game that really refined the Dizzy formula, with sharper puzzles and a more balanced difficulty level. We had planned on bringing back the Yolkfolk to Dizzy Returns, and it's great to see that you want them back too. Treasure Island Dizzy took second place, which is interesting because it shows that many of you weren't put off by the increased difficulty level caused by only having one life. We’ll be discussing various difficulty levels and settings in more detail in future design surveys. Thanks again to everyone who took part - those of you who have backed at 'Supporter of Dizzy’ level or higher can expect more questions coming your way next week! I voted for all of them; each one sounded good to me. A game with all of those elements/areas in would make for one hell of an adventure. I think I voted library and temple - I didn't vote lava caves because...I've just seen lava in SO many games I've played in the last 10 years. Now i did vote for lava caves... what else other than laver would surrond Zak's castle? Problem i have with Fantastic Dizzy was getting lost and not having a clue what on earth you were doing. Hope this isn't an issue in Dizzy Returns. Fantastic Dizzy for me is the weakest of the main game. But Kwic Snak, Fast Food and Go, dizzy go were great fun, but no idea how they could be involved some how, would be nice if they were, some way or another. @Deejay - I'm just guessing that those who've never played Dizzy before are from the U.S., like me. The only Dizzy game I ever found here was for the NES and was called "The Fantastic Adventures of Dizzy", known as Fantastic Dizzy to you across the pond. I did buy it way back when and really liked the story, animation and adventure aspects, though I was awful at playing it. Obviously, it had to be my "favorite", as it's the only one I ever played. Lava Caves: I have no problem with Trolls but was put off by Stealth! @Stephen Aww man, the Kiwk Snax music was, to use Codies marketing, "ABSOLUTELY BRILLIANT!!!" Ahem. This Kickstarter campaign really is exposing quite how obsessed I am. You've just reminded me that I learnt the keyboard solo from the intro of Kwik Snax... On the bass! I can't remember which I voted for now :( I played through every single non-console Dizzy game, so it was a very hard choice. @Ian Gehenna :) What I can't fathom is why so many people have never played a Dizzy game before! Interesting, I voted for Magicland as my favourite Dizzy Game and Spellbound would have been my second choice. That said, they both follow the format of Fantasy World quite closely and, on the topic of the rest of the Yolkfolk, they also both include them all. All the best Dizzy games, to my mind, had at least some other members of the yolkfolk in them. The ability to interact with other characters in the game was a source of light relife from the wandering around figuiring puzzles out. The inclusion of the Yolkfolk in Dizzy returns is a must to my mind. As for the locations, i voted for the areas that had that fairytale feel to them. I think the issue of the lava caves was i couldnt really see how that would work in an interesting way. I may have been doing it a disservice, but i imagined the cracks Ghyana (think that was how it was spelled) location in magicland dizzy and thought, well as one screen it would work but as an entire 'world' in the game? I wasn't so sure. Personally I think "Lava levels" have been done to death. It seems that every platform type of game has to check the "Lava level", "Snow Level" etc check boxes so that didn't interest me as much as some of the others. Thodore's Library sounded interesting and it made me imagine how different dimensions could be used in the puzzle game play in interesting ways. Made me think of Braid on XBLC (although that's time rather than dimensions) which I love. I voted for Treasure Island Dizzy although the single life did cause many many fits of frustration when dying. I especially curse getting caught in the wooden cage trap thing! How many answers have you got?